Remember the tragic incident that happened two yeas ago, where a nine-year-old child fell into a gap in the footpath during heavy rains, was carried by the gushing storm water and was found dead in a lake three kilometres away? The incident evoked sharp criticism and responses. A Public Interest Litigation was filed on the issue. The High Court asked the BBMP to repair all the deathtraps on footpaths and clear the encroachment. A footpath in a lane adjacent to Byrasandra government school, ward 58, C V Raman Nagar. Footpath slabs are broken almost in every locality. There are some volunteering groups that have taken the situation in their hand are finding solutions to the problem, by fixing it themselves. Yet the BBMP seems to have closed its eyes towards the existence of death traps and broken slabs on footpaths. 1) Complain to BBMP, through http://bbmp.sahaaya.in/ website or the app. 3) Call the ward level officials, corporators or MLAs and ask them to help citizens by getting them closed. 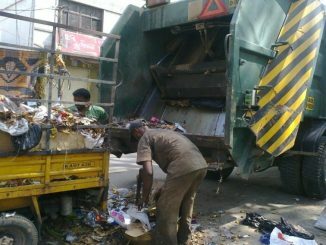 4) Take BBMP officials into confidence and help them fix it, by volunteering, contributing your time and ensuring that it’s done.